For God's perspective on any number of issues, the topically arranged scriptures in Bible Answers for Every Need are an indispensable help. Hundreds of Bible verses are included, in dozens of categories-from God, Jesus Christ, and the Holy Spirit, to Angels, Confession of Sin, Fellowship, Humility, Obedience, Prayer, the Rapture, and Witnessing. A separate section addresses issues of modern society, such as Bitterness, Divorce, Family, and Self-Will. Equally helpful to new believers and mature Christians, Bible Answers for Every Need provides just what you want: the right scripture at the right time-every time. Readers will find God's perspective on dozens of issues with the topically arranged scriptures in Bible Answers for Every Need. Equally helpful to new believers and mature Christians, Bible Answers for Every Need provides just what the reader wants: the right scripture at the right time--every time. When you need God’s perspective on an issue, turn to the topically arranged scriptures in Bible Answers for Every Need. When you need God's perspective on an issue, turn to the topically arranged scriptures in Bible Answers for Every Need. With hundreds of Bible verses in dozens of categories, this book is sure to give you the insights you need. Whether you're walking the path of spiritual growth, seeking guidance or comfort, telling others about God's Word, or just wanting to quote a timely passage from the Bible, you'll find just what you want: the right scripture at the right time--every time. 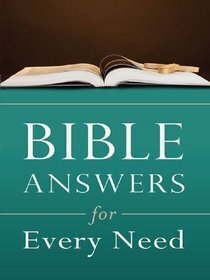 About "Bible Answers For Every Need"